1. 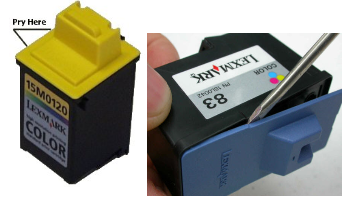 Remove the cartridge cap by prying with a knife or flat screwdriver (as seen below). 5. Repeat steps until all colors have been filled. 6. Clean off the cartridge. Use a tape to secure the cap on cartridge body. 7. Reinstall in printer and run one or two cleaning cycles until the cartridge begins to print correctly. Do not exceed three cleaning cycles.